Key Players - Mike Dirnt - bass. Tré Cool - drums. Billie Joe Armstrong - vocals, guitar. What caused me to blow off the dust? 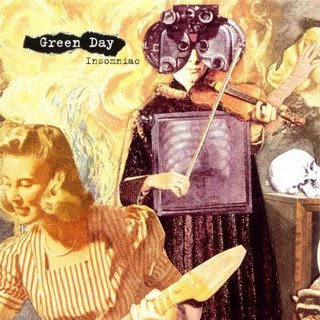 - With the release of the new record I wanted to go back and listen to some of their older stuff, but not American Idiot or Dookie. This just happened to be the one I grabbed. Overview - This is the fourth studio record by California based band Green Day. The band, who was coming off the huge success of "Dookie" released a darker and even heavier record than the 15 Million (world wide) sales of the predecessor. That didn't hinder the band at all, as this record would hit number 2 on the Billboard charts and sell a respectable 2+ Million copies. FDF Comments (aka the songs) - We are in and out of this record in 32:55, so here goes. Drums open up "Armatage Shanks" a few tom-toms before the guitar and bass come up. The scowl/howl of Billie Joe is instantly recognizable. The drums are quick and the bass line has a great punch. There is a short drum break down before the riffage returns and before you know it, we are done. (the longest song is just over 3:30). Armstrong starts of "Brat" a Cappella (well, just no instruments at all) then everyone kicks in. The verses are quicker than the prior track. It keeps the fun pop punk feel for the duration. Dirnt has a cool little bass fill early in the track, and it returns later in the tune before it wraps up. The band repeats the guitar line a few times and one more run thru the verse and we wrap up. "Stuck with Me" quickly opens up with the whole band firing. The band keeps the punk feel but has a little more noticeable shifts in chorus/verse. Cool changes the tempo a few times going in to various sections. Dirnt shines on this track if you really listen This track was released as a single in the UK but not the US. One of the three singles released to radio follows in "Geek Stink Breath". The track is still on modern rock radio and opens with crunchy guitars and driving, yet simple drums. The vocals are sung at a slower pace than the prior tracks, but the song still does not lack that "punch". Its a pretty safe track to release for radio. The guitar riffage returns on the intro to "No Pride". Dirnt has a cool fill, and Cool plays at a breakneck pace filling in any gap at all. Musically and lyrically this is a faster tune once more. A fun pop/punk track for sure. The albums "funniest song title" goes to "Bab's Uvula Who?". This song has some great "chug chug" sound to it. Armstrong sings at a quick clip and the band offers some harmonies for what feels like the first time. A true gem of a track. The "punch" of this song is its selling point. Cool opens up "86" with a drum workout and Dirnt offers up some good bass hook. Nothing overly flashy on this tune, we are not breaking any new ground, but that is okay..it fits w/the feel and sound of the record. The longest track on the disc "Panic Song" (3:38) opens with Dirnt giving the bass a work out with Cool doing a long period of drum rolls on this tom toms. Armstrong chimes some single notes over all the background noise and the band comes in with some big/heavy power cords and cymbal crashes. The tune is instrumental for almost two minutes. Then Armstrong comes in and the band hammers down at a breakneck pace. "Stuart and the Ave." has the Dirnt bass opening and before you know it the band is off to the races. "Brain Stew" and the track that follows it "Jaded" are often considered one long song (well for them at the time) "Brain Stew" opens with a single chugging guitar and Armstrong singing. The song keeps its choppy feel even when the bass and drums join. Its sort of "plods along" honestly when you listen to it. The tail end of it gets a little more rowdy but that is the seg into "Jaded" which is a far more up tempo affair. Everyone is really plugging along on this tune, vocals to instruments and 1:30 later we are done with a hard ending. "Westbound Sign" found an audience in recent years as it was used in the trailer for the Pixar film "Cars". We keep the Green Day feel and sound with the rapid fire vocals and guitars. "Tight Wad Hill", which is what the band was going to call this record to begin with, opens right up with vocals. Again, we are into that nice pop/punk groove. The album wraps up "Walking Contradiction" another track that builds up quick. This was another single released from the record but it had a difficult time cracking the top 20 on the Mainstream and Modern charts. The song is a good album closer. We get the good sing along chorus' and the good guitar riffs and bass fills. They leave us tired and satisfied. Where are they now? - Green Day is active to this day. They released their 8th studio record "21st Century Breakdown" in May of 2009 and are currently on tour. FDF Personal Comments (aka the Live experience) - The first was probably the most memorable time, September 9, 1994 at the MDC Hatchshell in Boston. This was a free concert put on by local radio station WFNX. It was very well attended and their were 'riots'. All I remember was seeing co-workers crowd surfing and drinking beers out of cans inside paper bags. Good times. In the end the band played only 7 songs, while 100 were hurt and 45 arrested. The second was November 3, 1995 at the Centrum in Worcester, MA. Again, GA floor went crazy and fans streamed from the seats to the floor. I was up on the side so it didn't bother me too much. We went a lot smaller on November 11, 1997 when they played Lupos. Tre set his drum set on fire at the end of this show. The final time I saw the band was May 31, 1998 at Great Woods as part of the WBCN River Rave. Its been a long time since I have seen them, might need to do so again. FDF Overall Take - Green Day has been around long enough where either you like them or you don't. Are they breaking any new ground, no not really, but the last few records have been very strong and they seem to be getting more critical claim than they ever have in the past. New fans could probably do just fine with the best of collection, but this is a pretty good sample of what the band is all about. There are tons of fan sites, you can find the official page here. Tracks taken from Insomniac, which you can buy here. Love love love them!!!!! And love their new album also!! I went to the Worcester and Lupo's shows with you and I'm pretty sure that the other notable thing about Worcester was Billy taking all of his clothes off on stage. Went to all those shows, and good call Jason, Billie definitely stripped at the Worcester show. Also, minor correction- Tre did not set fire to his drum set at Lupo's but certainly did at the River Rave (this was back when they did so at every outdoor gig). Tre went crowdsurfing at the end of the Lupo's show as well (I tried to pull off one of his chucks). See them again! I caught them three times during the American Idiot tour and they were good as ever.